San Francisco: No, we didn't place the wrong picture here. When you've got a sagging brand like Mercury, what do you do? If you're an executive with Ford Motor Company, you take the hot-selling Ford Escape, change a couple of things around, and rechristen it the Mercury Mariner. The new Mariner looks, drives, feels and even smells an awful lot like the Escape, yet - aw, heck - that's the whole story. Mercury tried to put a new spin on the popular compact sport utility, and in some ways it succeeded. The cabin seems slightly more upscale and opulent than the cheaper Escape thanks to softer materials and a muted, earth-tone color palette. It's no Lincoln, but it's better than the Ford - exactly like what you'd expect a Mercury to be. From the outside though, you get the feeling Mercury's designers weren't even trying. The Mariner looks so much like the Escape you could park them side-by-side and have a hard time figuring out which was which. They've got the same profile and the same basic body structure, making them the automotive equivalent of the Olsen twins. Who can tell the difference? Who cares? On the bright side, Mercury started with a rather handsome SUV - if there is such a thing - and added some styling touches that only make it better. It has a revamped grille with satin aluminum trim, a slightly different headlight and fog light setup, and chrome trim on the taillights to fit in with the Mercury family. 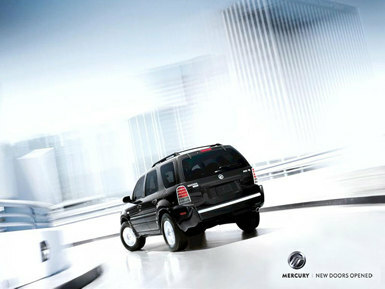 From the driver's seat, the Mariner feels exactly like the V6 Escape, and that's a good thing. It has the same independent suspension, the same 3.0-liter V6, and the same four-speed automatic transmission. Just like the Escape, the Mariner drives like a nice midsize sedan. It's built on a car platform to optimize on-road handling and comfort, and it even corners pretty well. On the downside, it's clearly not designed for heavy-duty, off-road driving like some of its competitors, including the Jeep Liberty and Nissan Xterra. Other than the subtle styling changes, what really sets the Mariner apart from the Escape is the way it's packaged with equipment. The base model, called the Convenience version ($21,405), has all the luxury basics, like power mirrors, power windows and locks, keyless entry, cruise control, and a leather-wrapped steering wheel. Step up to the Luxury package ($22,905), and you get a V6 engine, power driver's seat, six-disc CD changer, alarm, automatic headlamps, and a few other goodies. The top-of-the-line package, called Premier ($24,655), add 16-inch wheels, heated mirrors, an upgraded stereo, automatic headlamps, and power heated seats. Options include four-wheel drive (which adds nearly $2,000, depending on the package), a reverse sensing system, and side curtain air bags. Compared to a well-equipped Escape, that's not a bad deal at all. People who want an entry-level SUV will have to go with the Escape, but those looking for more options and better equipment should drive both the Escape and the Mariner to see which suits their needs - and budget - best. Why buy it? This is the Mercury Mariner, a slightly revamped version of the popular Ford Escape SUV, which looks and drives almost exactly like its cheaper cousin. The one area where the Mariner is a serious improvement over the Escape is in the interior, where better materials and a more pleasing color palette make it feel slightly more upscale.